And you thought you’d seen it all! I’ve mentioned this before, but in high school, I worked at a Japanese restaurant in my hometown. I worked there with my best friend, Shannon. It was such a perfect job to have as a high schooler. We only worked Friday and Saturday nights, but we made just enough to cover the essentials: trips to the mall (that’s a NJ girl thing), movie tickets, a dinner or two, coffees at Starbucks (although at that point, I was probably drinking Frappuccinos or something) and gas money. The head sushi chef loved sharing his newest creations with the staff. I remember when he developed sushi tacos my senior year (before they got trendy at restaurants!) – they were out of this world. I loved trying different types of sushi, especially when there were different types of fish or foods that I had never heard of, like tamago or unagi. I just had a blast learning about food! I wish I had the presence of mind back then to realize that was my main passion, but, heck at the time, it was just a “job” so I could buy Twizzlers when we went to see Mean Girls. They never let us try making sushi, so I was always intimidated by it. I always figured you needed special skills, superior dexterity and years of experience. Wrong! It’s actually pretty simple – it just takes patience and focus. 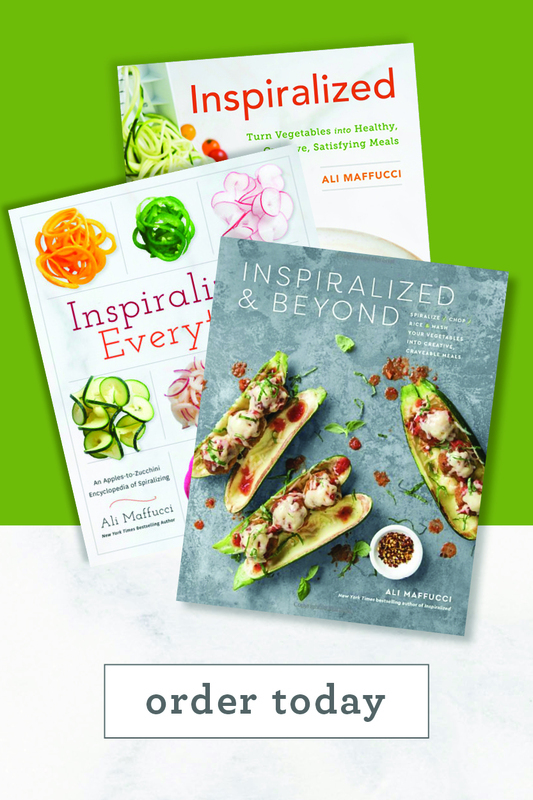 I actually have a sushi recipe (using spiralized cucumbers and beet rice) in my cookbook. That’s for maki sushi, which are the common type of sushi rolls. 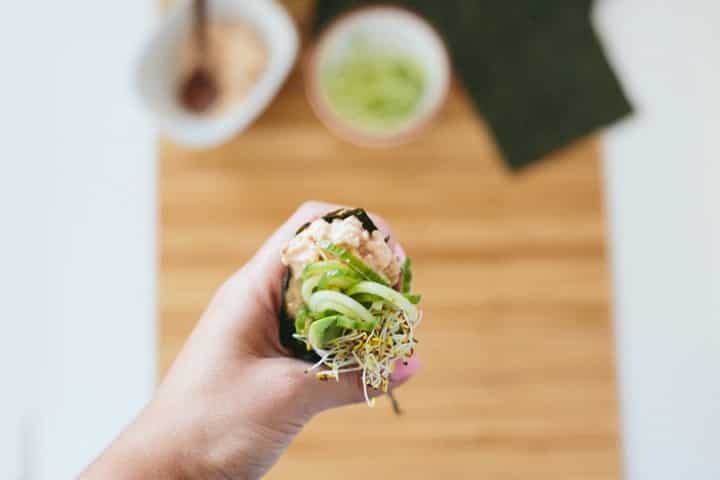 Today’s recipe is for hand rolls, which is a bit easier to make and more versatile – you can stuff in extras in a hand roll, but maki sushi’s a bit tougher, because you’re working with less room. 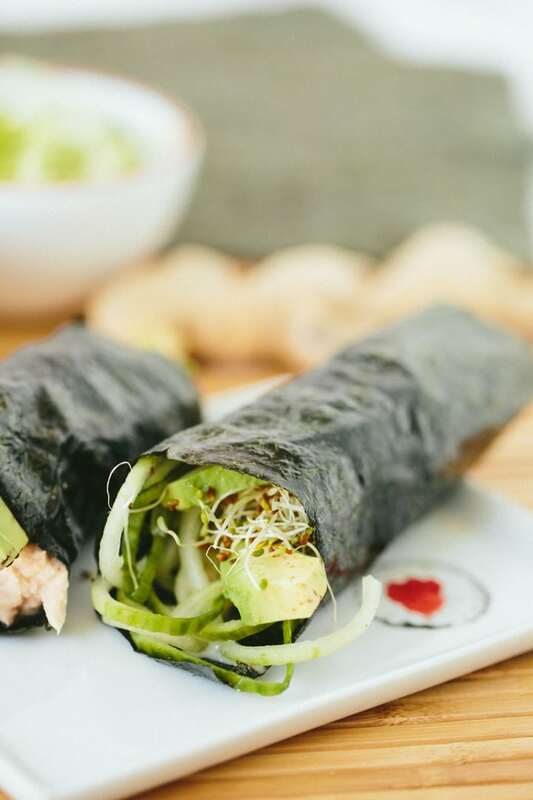 These hand rolls need to make it to your next sushi and wine night. 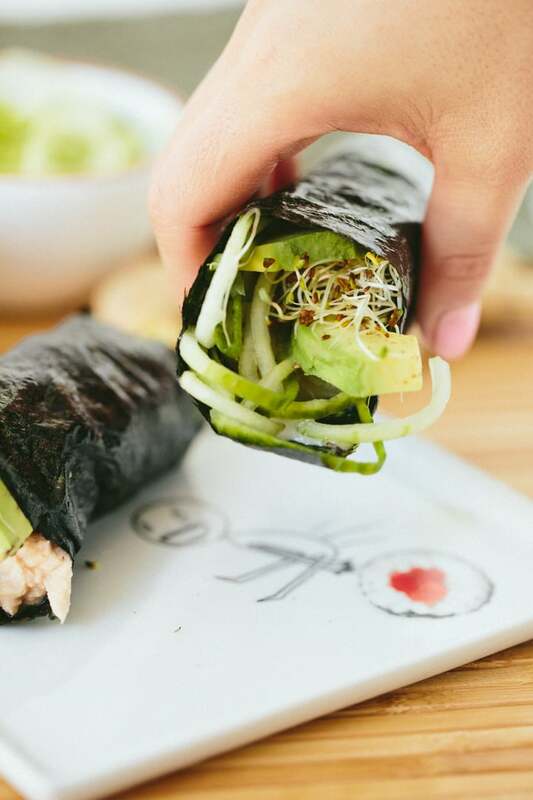 One person can spiralize the cucumbers and slice the avocado, one person can prepare the sriracha-ginger “fayo” with tuna and the other person can aseemble the hand rolls. Oh, and one person can of course pour the wine! 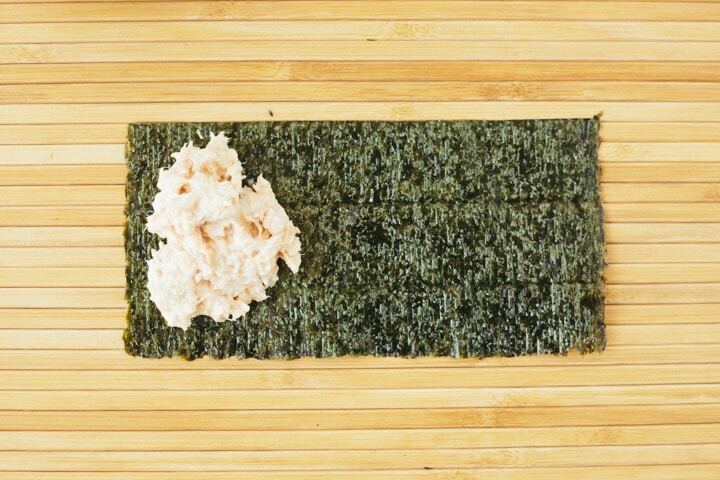 The sriracha-ginger “fayo” here is key – it takes out the fishiness of canned tuna (make sure you get a solid white albacore tuna, packed in water!) and it adds such flavor with the spiciness of the sriracha and the fragrance of the ginger. 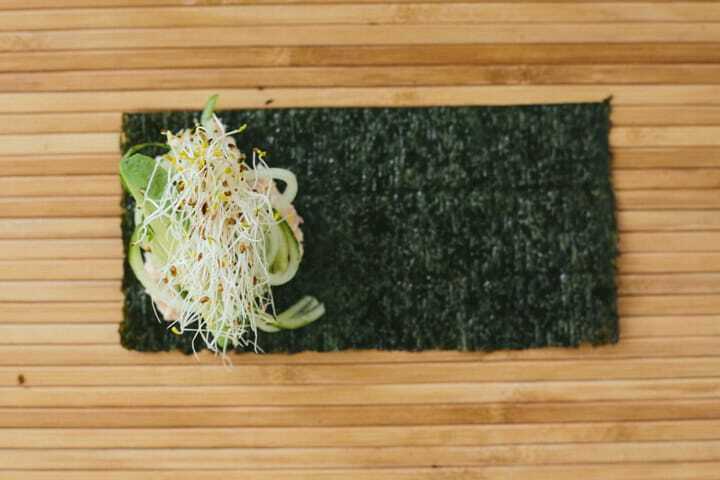 It complements the crunchy cucumber noodles, soft avocado and salty nori. Then, top with alfafa sprouts. Now it’s time to get your roll on. Ha! Roll like a burrito, keeping in mind the cone shape. 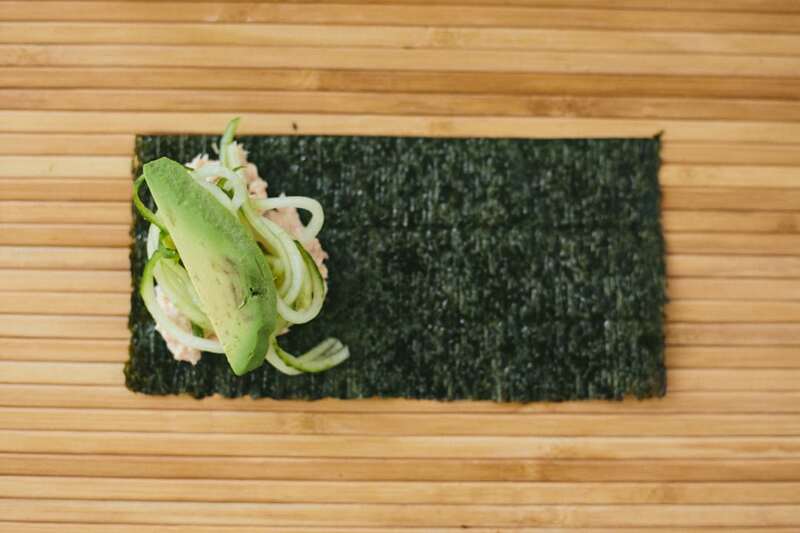 Et voila, you’ve got yourself a spiralized hand roll! Between the sushi roll in the cookbook and today’s hand roll, I think you have enough for a complete sushi night! 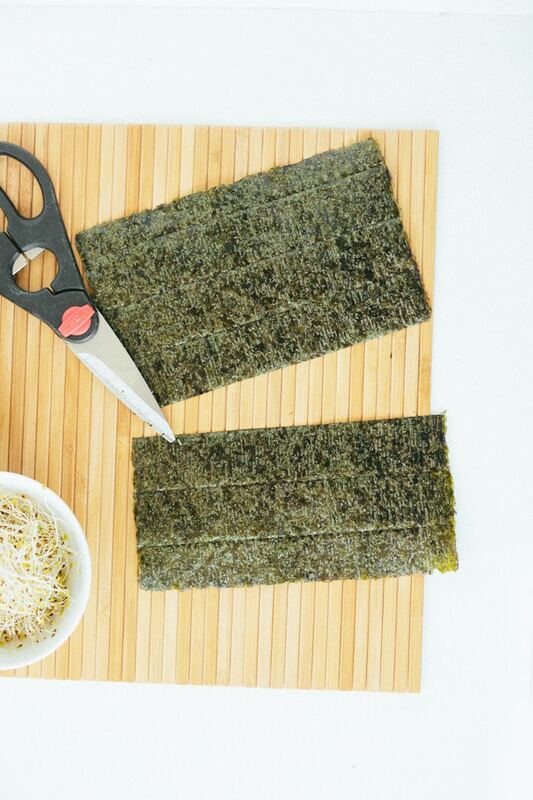 Lay out a nori sheet. 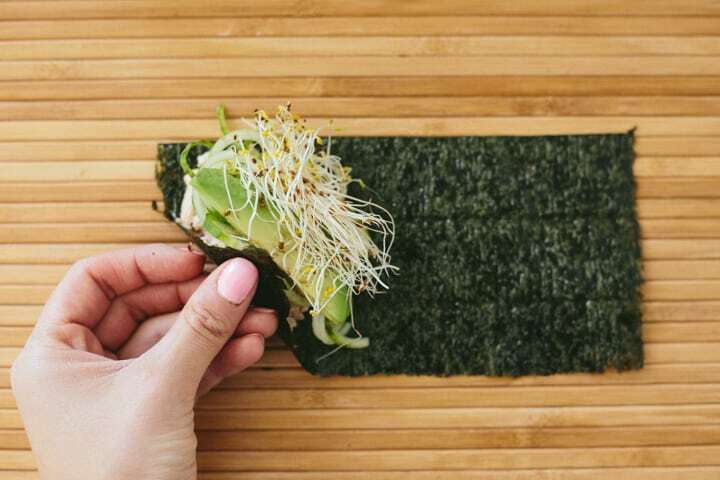 On the far left side of the nori sheet, add a scoopful of the tuna mixture and then top with cucumber noodles, sprouts and then avocado. 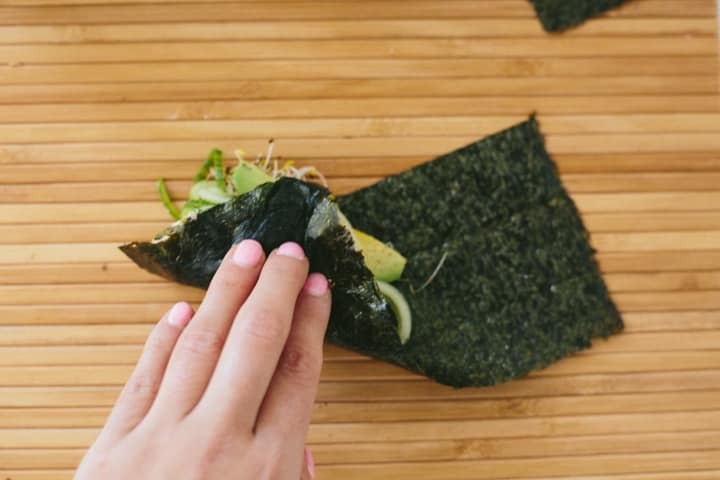 Roll the nori like a burrito. Continue until all nori sheets are used up. If you have extra ingredients, use as a garnish. 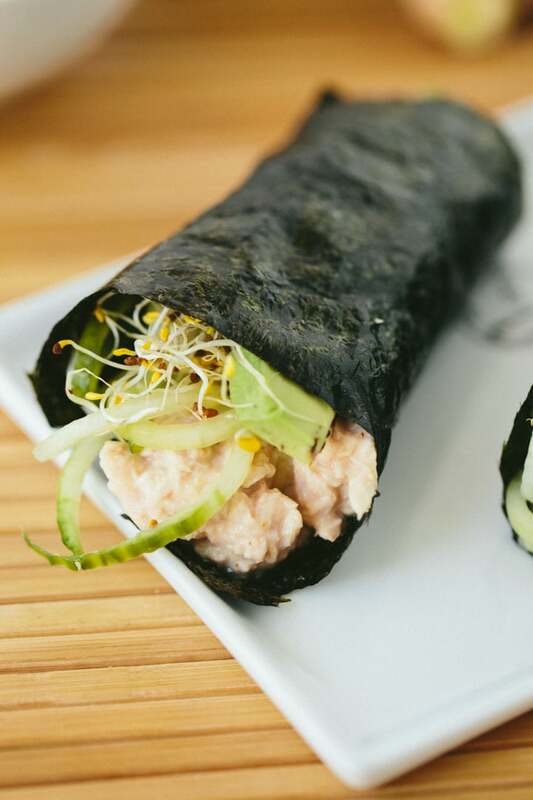 Can't wait to try the cucumber avacado tuna hand rolls. Have never used nori but willing to give it a try! Now to find some nori! I want to try them all but the soy ginger sounds awesome. I just receiver your cookbook in the mail. Can't wait to try this sushi recipe and the one in the book! I love sushi! 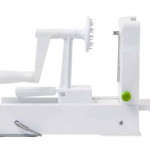 But I have always been intimidated by the process, and using raw fish. Until now! The Tessemae lemon dressings are all calling to me, but lemonette is the one I would try first. Intriguing name! Carol, it's so great to hear from you! I'm so glad you got the cookbook!! i'd love to try the soy ginger! This one sounds great! I have been going thru a sushi-inspired spiralizing phase and love doing deconstructed sushi salad bowls with smoked salmon slices... everyone at work thinks its so strange! oh well! would love the lemon garlic sause! oh my goodness, these look amazing!!! all i need are the nori sheets...on the menu this week for sure! Balsamic would be one of my top choices, but they all sound delicious! I'm making my shopping list now and I will be eating the wraps tonight. I can't wait. I hear the Lemon Chesapeake marinade/dressing calling my name! Thank you so much, danielle!! 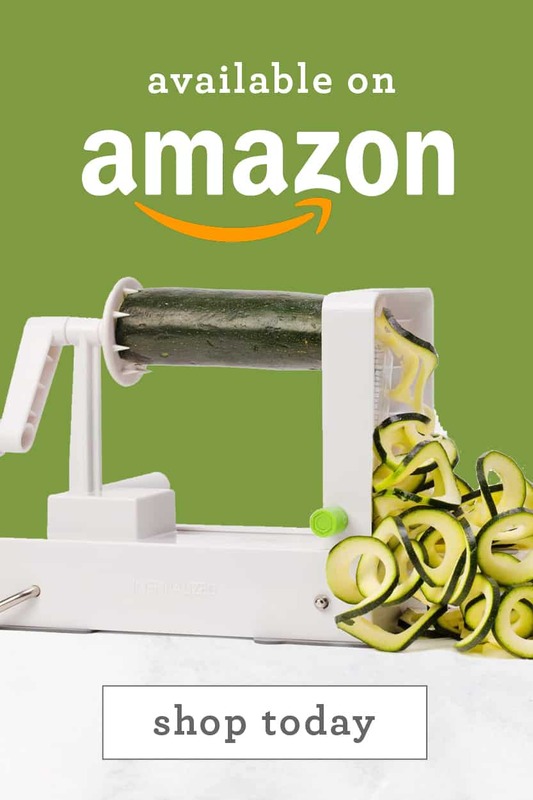 If you have a chance, I'd love you to leave a review on Amazon, it's so helpful! thank you so much for this recipe! I can't wait to try!!! 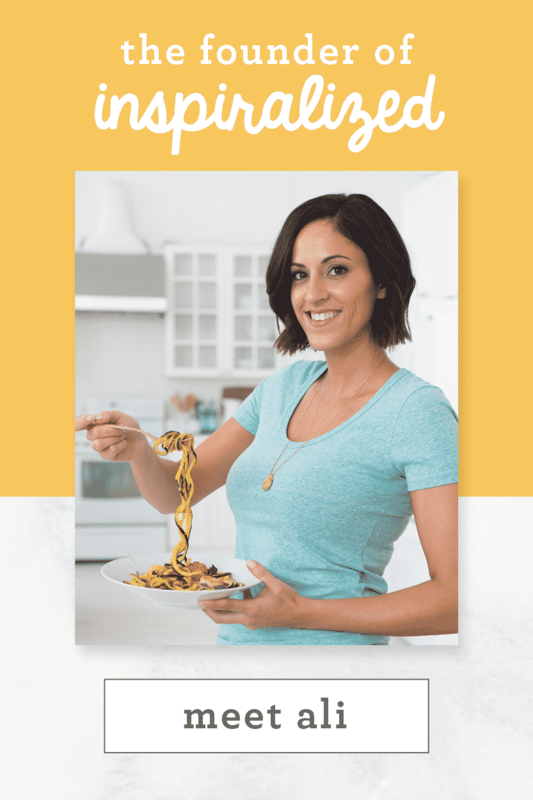 I'm ordering your cookbook asap! Yum!! Looks good. Not a huge fan of suchi but always willing to give it a bite to try it. 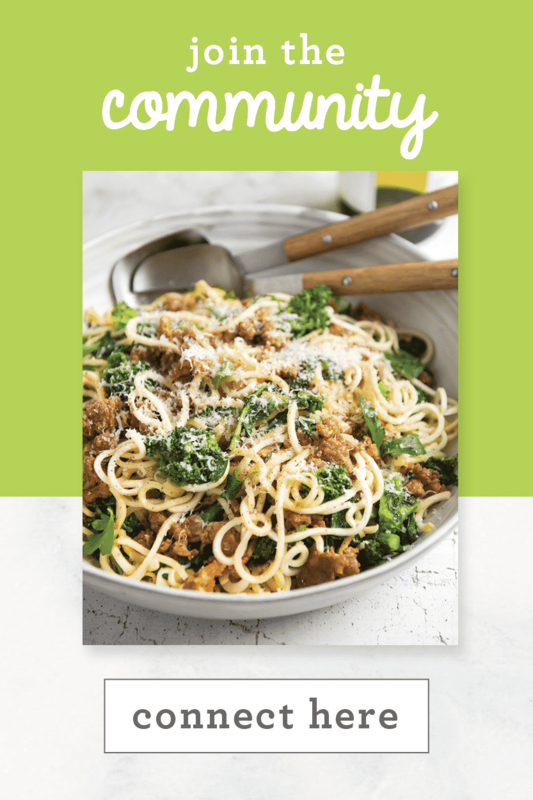 Cook book is awesome. 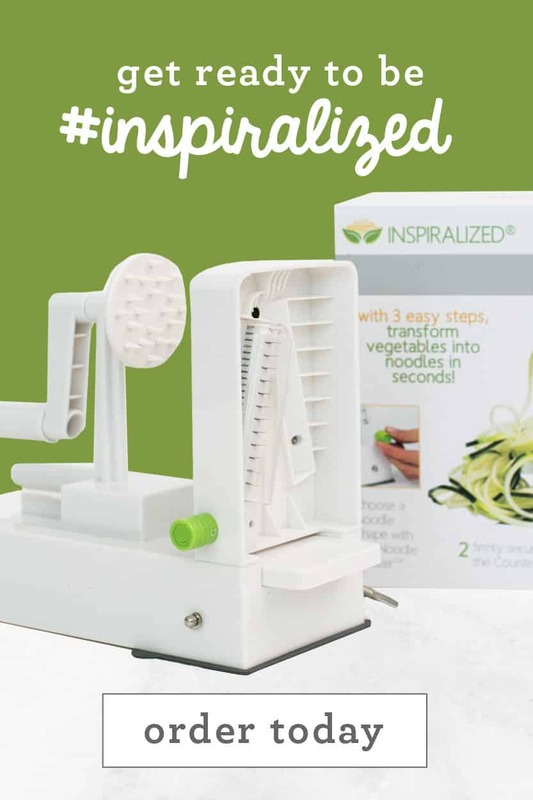 Lots of great receipe's to try!! Since I am from Chesapeake, would love to try the flavor, Lemon Chesapeake from the rainbow pack. 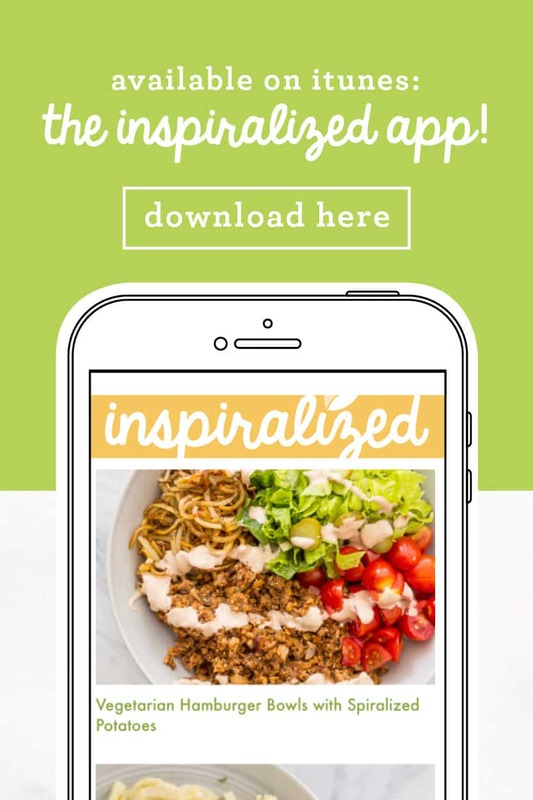 I recently purchased your book and have shared it with another "spiralizist" ! 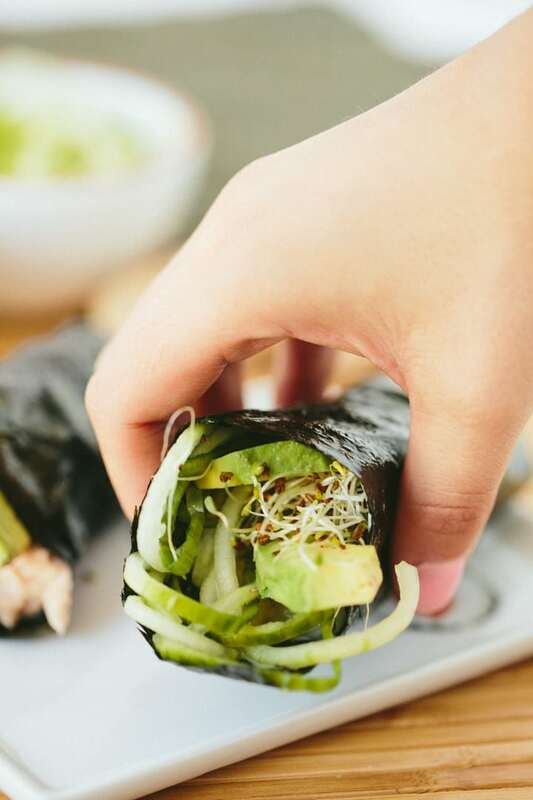 Not a super fan of nori or any seaweed flavor, but i want to try this with rice paper wraps; give it that summer roll feel! yummy! This handroll looks yummy! I'd love to try Tessamae's Mild Hot Sauce to make some wings! They look wonderful, thanks! I'm sure I will be able to find something to take the place of the tuna, maybe marinated Hemp-fu (have you tried it yet? - it's yummy!). Actually, the possibilities are endless aren't they? I'm thinking Rock 'n Hand Roll party! PS...a special thank you to the folks at Tessemae for the (possible) opportunity to savor all their flavors, mmmmmm! I love this recipe! 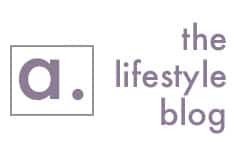 I have really been wanting to try the Tesserae products but have yet to do so, been living a mostly Whole30 Life so I found this product is whole30 approved so I thought I might try them out ASAP! I'm a huge fan of Tessemae’s and have bought a few of their dressings at Whole Foods. I honestly can't pick one. I would love to try them ALL! This recipe looks very tasty! Going to try it out. 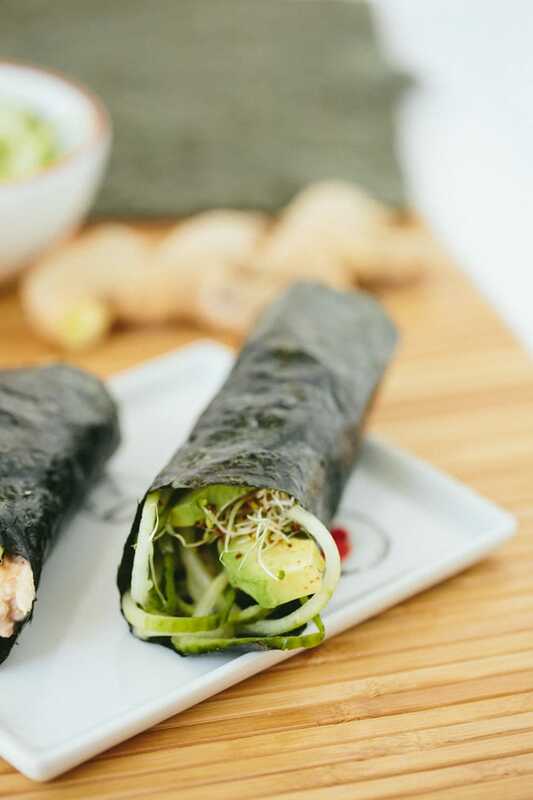 This recipe looks very good, but since I'm not a big nori fan, I think that I would like to make my "hand roll" using a big romaine lettuce leaf..
Made these for lunch yesterday and ate the whole lot, INCREDIBLE! Will be making again and again! This is awesome to hear, Jen! Thank you!